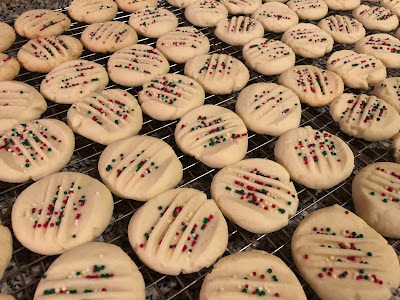 I was recently looking for a yummy shortbread cookie, but tbh, I wasn't really looking forward to the rolling and cutting or the cookie press that usually goes along with baking shortbread cookies. Then I found this Taste of Home recipe that simplified everything! You just roll the dough into balls, add a little sprinkle, and into the oven they go! Simple, right? And they taste delicious!! They're so buttery they just melt in your mouth! And they're so pretty they add a festive touch to any Christmas cookie platter! So if you're feeling like a little shortbread, but you're not feeling like the rolling and the cutting, definitely give this one a try! In a large bowl, cream butter and confectioners' sugar until light and fluffy. Gradually add flour and cornstarch, beating until well blended. With hands lightly dusted with additional cornstarch, roll dough into 1-in. balls. Place on ungreased baking sheets. Press lightly with a floured fork. Top with nonpareils or cherry halves. Bake at 300°F for 20-22 minutes or until bottoms are lightly browned. Cool for 5 minutes before removing from pans to wire racks. For extra flavor, add a tsp of any kind of extract you like. Vanilla, almond, orange, lemon, anything you like!